WHITE HOUSE - U.S. President Donald Trump says Iran has been "formally put on notice" for its ballistic missile launch. 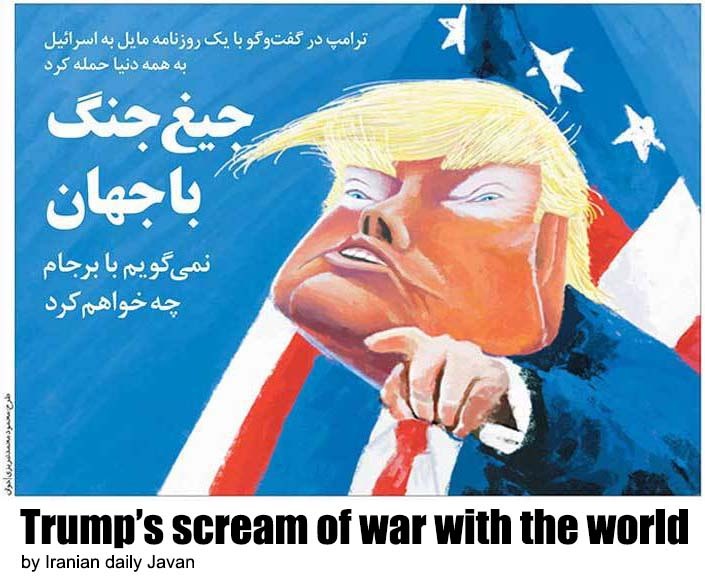 His message came during a series of tweets in which he also continued his condemnation of the agreement that the U.S. and five other world powers reached to curb Iran's nuclear program in exchange for sanctions relief. Trump said Iran should be "thankful" for the agreement, and that the country was "ready to collapse" before the billions of dollars were unfrozen. The nuclear deal came in response to allegation Iran was working to develop weapons, which Iran denied, and required Iran to limit its enrichment of uranium and convert several of its nuclear facilities to other uses. On Wednesday, it was Trump's National Security Advisor Michael Flynn who condemned the missile launch, declaring it "just the latest in a series of incidents" in which Iran has threatened the U.S. and its regional allies over the past six months. He said leaders in Tehran were emboldened to take such action now because the nuclear agreement is "weak and ineffective," and because the other nations involved in the agreement failed to take action to rein in Iran's military ambitions. During a briefing at the White House, Flynn accused former President Barack Obama and other members of his administration of not being tough enough on Tehran. "The Obama administration failed to respond adequately to Tehran's malign actions - including weapons transfers, support for terrorism and other violations of international norms," Flynn said. "The Trump administration condemns such actions by Iran that undermine security, prosperity and stability throughout and beyond the Middle East and place American lives at risk." Flynn added, "As of today, we are officially putting Iran on notice." He did not explain his comment further, and threaten any specific action against Tehran. Late Wednesday, senior White House officials said Iran's ballistic missile launch and its support for Houthi rebels in Yemen are provocative, are destabilizing the region and are threatening multiple countries, including U.S. allies. The officials said the United States will respond "appropriately." Asked what kind of action the U.S. might take, the officials would only say they have a large range of options available. However, senior White House officials said the Iranian missile launch and a possible U.S. response are separate from the Iran nuclear deal, and that the White House is not accusing Iran of violating the original agreement. Ian Lustick, a political science professor at the University of Pennsylvania, told VOA that the U.S. has to be careful in dealing with Iran's actions, citing as an example that Iran could make things worse for the 6,000 U.S. soldiers who are in Iraq. "The majority of the population in Iraq is Shia and sympathetic in one way or another to Iran. There are very large and powerful militias in Iraq that are commanded by and trained by the Iranians. Those are some of the best fighting units that have had success against ISIS." A U.S. advocacy group, United Against Nuclear Iran, said international businesses are confused and uncertain about Iran's behavior and the American government's reaction. David Ibsen, UANI's president, said it has discouraged its contacts from trying to establish new deals with Iran. In an interview with VOA Persian, Ibsen said companies are asking whether Iranian missile tests will result in a re-imposition of financial sanctions on Tehran. "They also ask, if a company has dual-national citizens (in Iran), will they be kidnapped or held incommunicado by the Iranian regime? Will they be doing business with front entities for the regime or the Islamic Revolutionary Guard Corps? All these risks are very real, and companies have taken our warnings to heart," Ibsen said. Wednesday's pronouncement from the White House came after lengthy consultations with key U.S. officials, through what is often described as the interagency process. Some officials with knowledge of the discussions described Iran's actions as provocative, but still largely in line with Tehran's behavior over the past several months. "It is hard to know what the administration has in mind," said a former senior official in the Obama administration familiar with the Iran nuclear deal negotiations. "Of course we should be concerned about Iran's missile activity," the official said. "The U.S. has robust bilateral sanctions that are missile-related which we should absolutely enforce." Iran confirmed Wednesday that it carried out a missile launch Sunday, but said this did not violate the nuclear agreement by six world powers and Tehran in 2015. U.N. Security Council Resolution 2231, adopted after the nuclear deal was reached , called on Iran not to undertake any activity related to ballistic missiles, but it did not specifically ban such activity. Shahir Shahidsaless, an Iranian-Canadian political analyst, told VOA Persian Wednesday that the resolution's lack of an explicit ban on ballistic missile activity is problematic for Washington. "The United States cannot rely on this resolution to condemn Iran at the U.N. Security Council, and for the same reason, Russia and China will not cooperate with the U.S. on this," Shahidsaless said. The U.S. ambassador to the United Nations, Nikki Haley, denounced Iran's missile launch as "absolutely unacceptable" during a Security Council meeting Tuesday, and said the Trump administration will not turn a "blind eye" to such actions. Britain's U.N. envoy, Matthew Rycroft, echoed Haley's concerns. "There was very significant concern about the ballistic missile launch." He said the January 29 launch was "inconsistent" with Resolution 2231. Iran's U.N. mission issued a statement reiterating Tehran's position that "Security Council Resolution 2231 does not prohibit legitimate and conventional missile activities." VOA Persian NewsHour host Guita Aryan contributed to this report. Jeff Seldin works out of VOA's Washington headquarters and is national security correspondent. You can follow Jeff on Twitter at @jseldin or on Google Plus.